Are you on the prom-planning committee this year? Or maybe you just want to throw a killer pre-prom or after party? Go with the equally classy and edgy Steampunk theme. Check out some steampunk prom ideas from 2014 and keep on reading below for some totally fresh ideas for 2015. Depending on if you are planning the school prom, or your own smaller after-party—there are a lot of options for location. An old industrial warehouse or factory, would make for a punk-heavy feel. A restored train depot or even museum would make for high-class steampunk options. Victorian-style houses are popular as bed and breakfast businesses. Often they have large sitting rooms or libraries on the main floor that would be the perfect venue for a small steampunk pre-prom party. Wherever you hold your steampunk prom event make sure to set up a photo booth stocked full of steampunk photo props. Print a large sepia-toned image for the backdrop. Then give your guests access to parasols, steampunk-modified dart blasters, and maybe even a penny-farthing bicycle and pretty soon they’ll all be posing together for selfies to post online for everyone else to enjoy the steampunk fun! If you look around, you may be able to find a great Steampunk Prom Dress for sale. Another good idea is to find a basic corset-style formal dress in a dark rich color (think burgundy, or royal blue) and steam it up a little yourself. 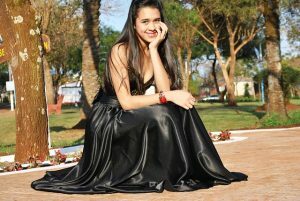 Many people like to pin the front of a longer dress up above the knee on one side. This is perfect for showing off some great leather boots. 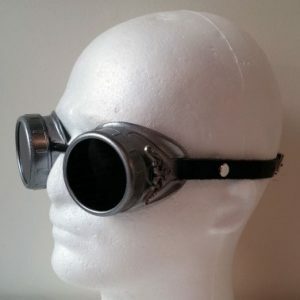 And a pair of goggles will improve any steampunk outfit immensely. These Vintage Lace & Pearl Steampunk Goggles would be a great accessory with a prom dress. They look totally classy and dressed up, and a matching string of pearls around your neck would really bring attention to them. Guys often wear a tuxedo suit to prom, and if you get one with tails it is especially appropriate for a steampunk prom. If you select a dress shirt to go with it that has a “French cuff” then you can incorporate some steampunk cufflinks. 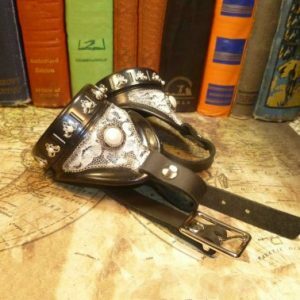 A top hat is definitely proper while wearing a formal tuxedo, and these Silver Filigree Goggles would really stand out on top of a slick black top hat. The goggles are versatile enough to go with a more casual steampunk look as well, if a tuxedo is not really your thing. A steampunk prom would be a fitting event for a dressier steampunk military uniform–if that’s more your style. And of course a rogue steamship pilot is always a welcome addition to any steampunk party!